Since 1949 Wath Mill had been used as a storage space for the Wath Estate. Whilst this has preserved many of the wonderful features of the milling machinery and artefacts, time had taken its toll. Damp had spread through the building, rusting the ironwork and rotting timbers. A section of the huge timber joists under the millstones had rotted, weakening the floor. 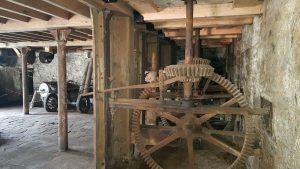 The millstones, gears and drive mechanism needed rescuing from imminent collapse. During the spring of 2017 professional millwrights Dorothea Restorations restored the four sets of millstones and saved the timber joists. Wath Mill has been safeguarded for future generations to appreciate and enjoy. The Landscape Partnership is grateful for additional support from Harrogate Borough Council, SPAB Mills Section, and owners John and Tom Wheelwright.